Play some ball, cool off with the splash pad or play on the Boundless Playground! Kreager Park is full of fun things to do! Kreager Park is a great place to get out and play some ball! With tennis courts, soccer fields and softball fields, you can always come and enjoy a fun pick-up game! 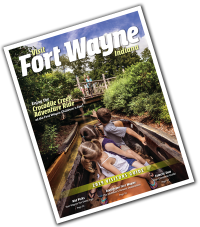 Kreager Park featues a splash pad as well as Indiana's first Boundless Playground, an inclusive playgrounds where children of all abilities gain the important developmental and physical benefits of unstructured play.